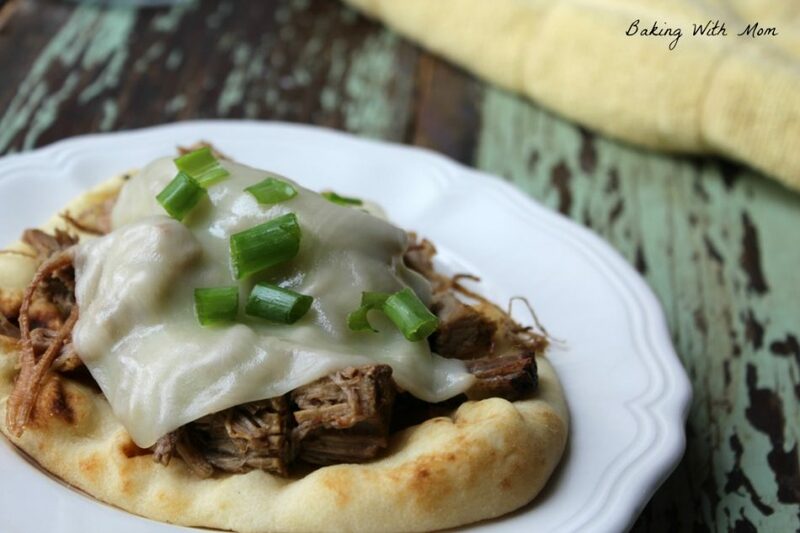 Crock Pot Shredded Roast Beef On Flatbread was declared “outstanding” and “delicious” by my hubby. That is a seal of approval. Trust me. *This post contains my affiliate link. If you click on the link I may receive a commission. Are you a busy person? Is your family running from activity to activity? 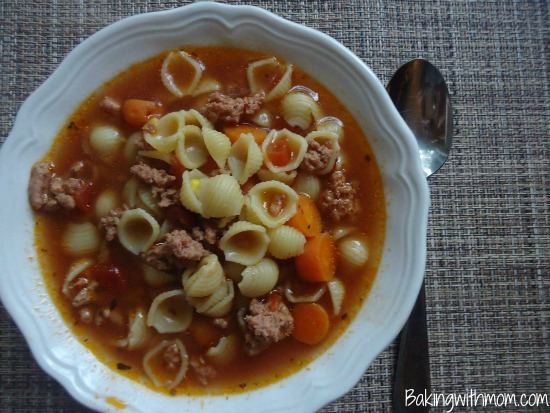 Do you need supper when you walk through the door (and in between kid pick ups and drop offs)? Yes, we do too. 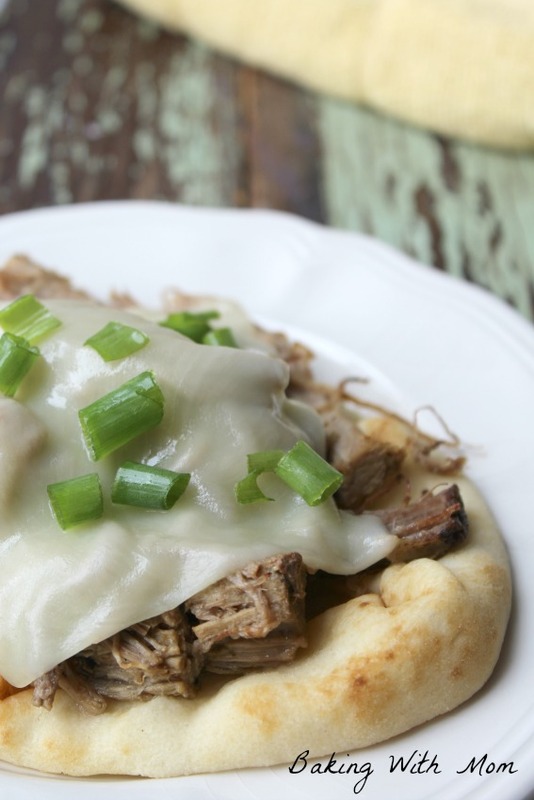 This Crock Pot Shredded Roast Beef On Flatbread is just the answer you are looking for. I was shopping at Sam’s Club the other day and came across an Eye of Round Roast on “meat sale” as my husband likes to call it. I have absolutely no problem buying meat on last day to buy sale, and he has come around too. Though it took a few years. 😉 He really doesn’t mind when it means meat I wouldn’t normally buy but now it is a great price. As soon as Caleb and I came home from shopping, I put the roast beef into the crock pot. I am rather picky about the type of crock pot I use, as I need one large enough to feed my family of six. A must have? The locking lid. Great for potlucks and family gatherings. After putting the roast in the crock pot, I added some sliced onions and delicious Pink Sea Salt. Normally, I am a typical table salt gal (you know, the umbrella one), but I came across this Pink Sea Salt and it.is.delicious. Totally and completely. Didn’t know salt could be delicious. But it is. After I added the onions, pepper and sea salt, I turned the crock pot on high and walked away. The crock pot did its magic and later on that night, supper smelled wonderful. After draining the juices to make gravy, I returned the roast beef to the crock pot and shredded the meat. Use beef broth and pour over the roast beef. Turn the crock pot to low and let simmer for another 30 minutes or so. You can eat the roast beef plain or add it to a bun for a sandwich. We also ate it on baked potatoes with the above mentioned gravy. Oh, yes we did. However, the next day is when the recipe really shined. I bought some flatbread on clearance (really, are you surprised?). I took the flat bread and layered the roast beef on top. Then, placed a slice of mozzarella cheese on the roast beef. Baked in the oven for 5-7 minutes and you have what my husband called “outstanding”. 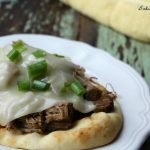 Crock Pot Shredded Roast Beef On Flatbread an easy recipe for your family that can be eaten for lunch the next day too!